Local anesthesia — Only the area that is being operated on is numbed. General anesthesia — Blocks pain and keeps you asleep through the surgery; given through an IV (needle in your vein) in your hand or arm. You will also be given either general or local anesthesia. The skin over the area will be cleaned. The doctor will make a small cut over the area. 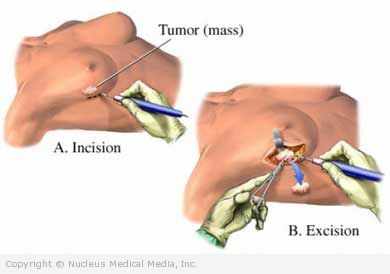 A sample of the tissue or all of the mass will be removed. The doctor will close the site with stitches or staples. A bandage will be applied. This technique will be used if the mass is too deep to be felt but can be seen with imaging tests. Once the mass is located, the doctor will place a fine wire into your breast that points to the spot that needs to be biopsied. She will make a small cut in the area and remove the mass. Breast surgical biopsy – How Long Will It Take? Breast surgical biopsy – Will It Hurt? You may feel pain in your breast after the biopsy. Your doctor will prescribe pain medicine. Restrict exercise for 2-3 weeks after surgery. It will take about 2-5 days to receive your test results.